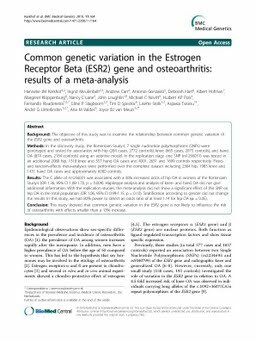 Background: The objective of this study was to examine the relationship between common genetic variation of the ESR2 gene and osteoarthritis.Methods: In the discovery study, the Rotterdam Study-I, 7 single nucleotide polymorphisms (SNPs) were genotyped and tested for association with hip (284 cases, 2772 controls), knee (665 cases, 2075 controls), and hand OA (874 cases, 2184 controls) using an additive model. In the replication stage one SNP (rs1256031) was tested in an additional 2080 hip, 1318 knee and 557 hand OA cases and 4001, 2631 and 1699 controls respectively. Fixed- and random-effects meta-analyses were performed over the complete dataset including 2364 hip, 1983 knee and 1431 hand OA cases and approximately 6000 controls.Results: The C allele of rs1256031 was associated with a 36% increased odds of hip OA in women of the Rotterdam Study-I (OR 1.36, 95% CI 1.08-1.70, p = 0.009). Haplotype analysis and analysis of knee- and hand OA did not give additional information. With the replication studies, the meta-analysis did not show a significant effect of this SNP on hip OA in the total population (OR 1.06, 95% CI 0.99-1.15, p = 0.10). Stratification according to gender did not change the results. In this study, we had 80% power to detect an odds ratio of at least 1.14 for hip OA (α = 0.05).Conclusion: This study showed that common genetic variation in the ESR2 gene is not likely to influence the risk of osteoarthritis with effects smaller than a 13% increase.